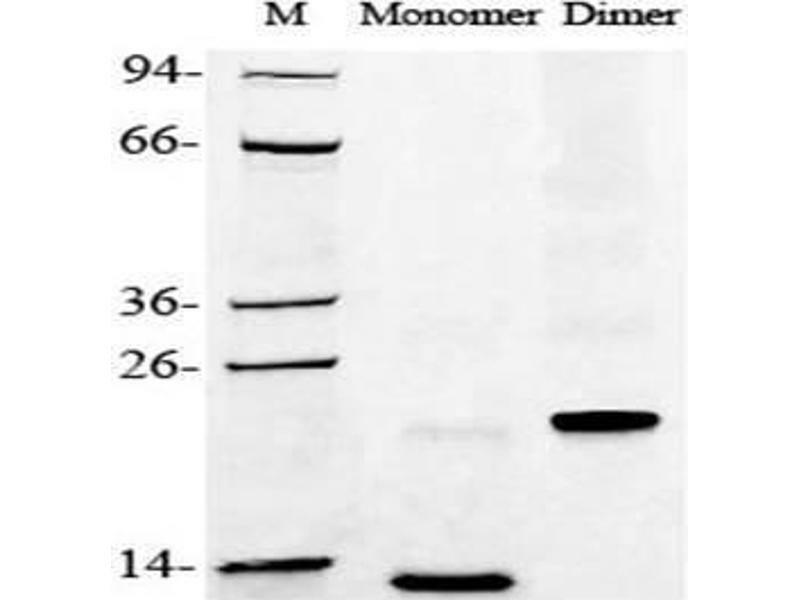 2 μg of BMP-2, Human was resolved with SDS-PAGE under reducing (Monomer) and non-reducing (Dimer) conditions and visualized by Coomassie Blue staining. 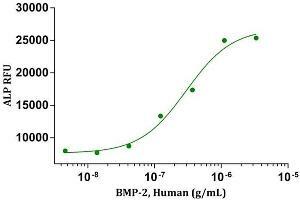 BMP-2, Human induced alkaline phosphatase production in C2C12 cells. The ED50 for this effect is less than 1μg/mL(0.68μg/mL). 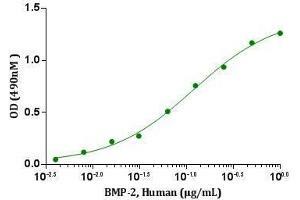 BMP-2, Human induced alkaline phosphatase production in ATDC-5 cells. The ED50 for this effect is less than 1μg/mL(0.09μg/mL). 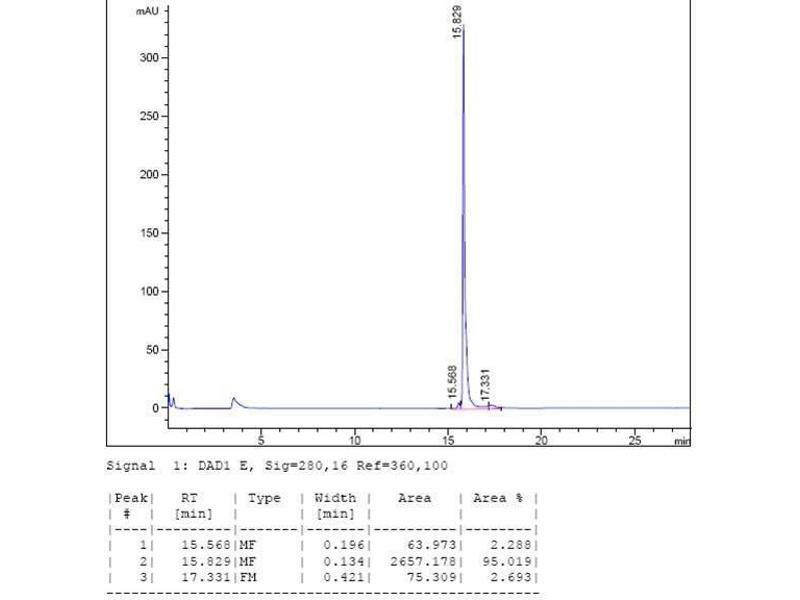 Characteristics ED50 < 1 μg/mL, measured by alkaline phosphatase induction assay using C2C12 cells. AA 283-396, expressed with an N-terminal Met. 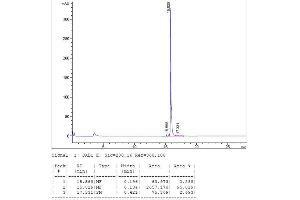 Purity > 95 % as analyzed by non-reducing SDS-PAGE. Endotoxin Level < 1 EU/μg, determined by LAL method. 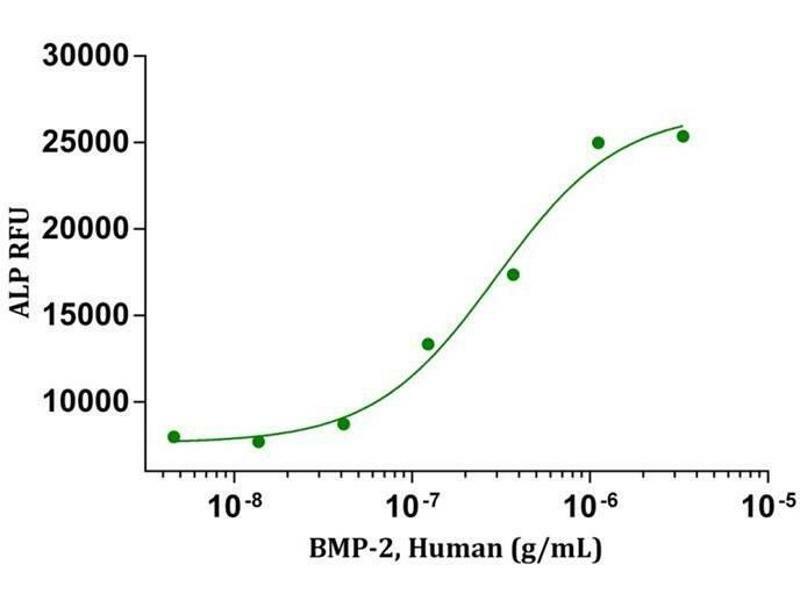 Background Human Bone Morphogenetic Protein-2 (BMP-2) is a bone-growth regulatory factor and belongs to the transforming growth factor-beta (TGF-beta) superfamily. Human Bone Morphogenetic Protein-2 (BMP-2) is synthesized as large precursor molecule (Met1-Arg396, with a signal peptide from Met1 to Gly23), propeptide (Leu24-Arg282) of which is cleaved by PCSK5 (Proprotein Convertase Subtilisin/Kexin type 5). The active form consists of a dimer of two identical proteins which are linked by a disulfide bond at Cys360. It plays an important role in the development of bone and cartilage, cardiac cell differentiation and epithelial to mesenchymal transition. It is also involved in the hedgehog pathway, TGF-beta signaling pathway, and in cytokine-cytokine receptor interaction. 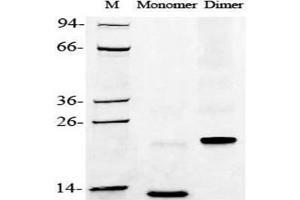 Recombinant human Bone Morphogenetic Protein-2 (rhBMP-2) produced in E. coli is a disulfide-linked homodimer containing two non-glycosylated polypeptide chains of 115 amino acids. A fully biologically active molecule, rhBMP-2 has a molecular mass of 26 kDa analyzed by non-reducing SDS-PAGE. Reconstitution Reconstituted in 20 mM AcOH or 5 mM HCl. 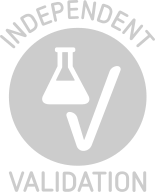 The solubility should be at 100 μg/mL. Buffer Lyophilized after extensive dialysis against 50 mM acetic acid. Storage Comment Lyophilized recombinant human Bone Morphogenetic Protein-2 (rhBMP-2) remains stable up to 6 months at -80 °C from date of receipt. Upon reconstitution, rhBMP-2 should be stable up to 2 weeks at 4 °C or up to 3 months at -20 °C. 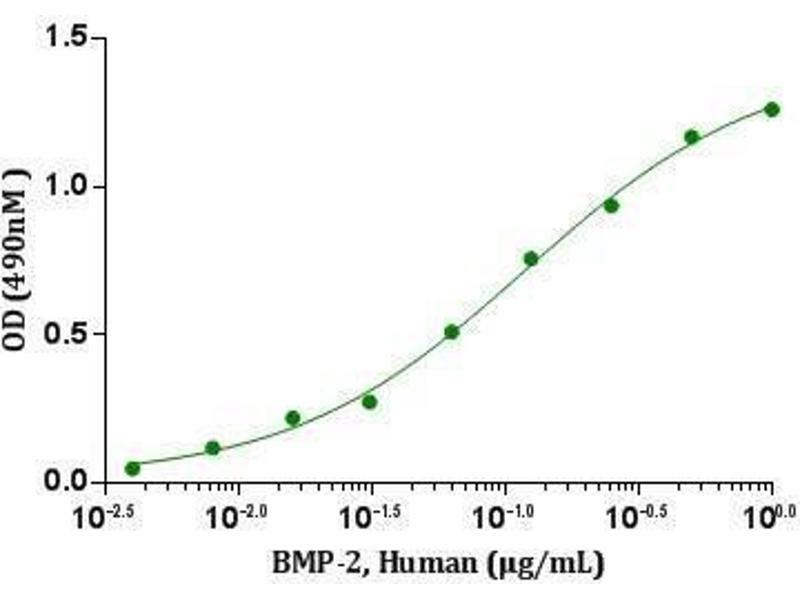 Product cited in: Wang, Park, La Marca, Than, Lin: "BMP-2 inhibits tumor-initiating ability in human renal cancer stem cells and induces bone formation." in: Journal of cancer research and clinical oncology, Vol. 141, Issue 6, pp. 1013-24, 2015 (PubMed). Chanchareonsook, Tideman, Feinberg, Jongpaiboonkit, Lee, Flanagan, Krishnaswamy, Jansen: "Segmental mandibular bone reconstruction with a carbonate-substituted hydroxyapatite-coated modular endoprosthetic poly(?-caprolactone) scaffold in Macaca fascicularis." in: Journal of biomedical materials research. Part B, Applied biomaterials, Vol. 102, Issue 5, pp. 962-76, 2014 (PubMed). Clark, Milbrandt, Hilt, Puleo: "Mechanical properties and dual drug delivery application of poly(lactic-co-glycolic acid) scaffolds fabricated with a poly(?-amino ester) porogen." in: Acta biomaterialia, Vol. 10, Issue 5, pp. 2125-32, 2014 (PubMed). Alegre-Aguarón, Sampat, Xiong, Colligan, Bulinski, Cook, Ateshian, Brown, Hung: "Growth factor priming differentially modulates components of the extracellular matrix proteome in chondrocytes and synovium-derived stem cells." in: PLoS ONE, Vol. 9, Issue 2, pp. e88053, 2014 (PubMed). Cushnie, Ulery, Nelson, Deng, Sethuraman, Doty, Lo, Khan, Laurencin: "Simple signaling molecules for inductive bone regenerative engineering." in: PLoS ONE, Vol. 9, Issue 7, pp. e101627, 2014 (PubMed). Asai, Otsuru, Candela, Cantley, Uchibe, Hofmann, Zhang, Wapner, Soslowsky, Horwitz, Enomoto-Iwamoto: "Tendon progenitor cells in injured tendons have strong chondrogenic potential: the CD105-negative subpopulation induces chondrogenic degeneration." in: Stem cells (Dayton, Ohio), Vol. 32, Issue 12, pp. 3266-77, 2014 (PubMed). Saldanha, Bragdon, Moseychuk, Bonor, Dhurjati, Nohe: "Caveolae regulate Smad signaling as verified by novel imaging and system biology approaches." in: Journal of cellular physiology, Vol. 228, Issue 5, pp. 1060-9, 2013 (PubMed). Wang, Park, Zhang, La Marca, Claeson, Than, Rahman, Lin: "BMP-2 inhibits tumor growth of human renal cell carcinoma and induces bone formation." in: International journal of cancer. Journal international du cancer, Vol. 131, Issue 8, pp. 1941-50, 2012 (PubMed). Darcy, Meltzer, Miller, Lee, Chappell, Ver Donck, Montano: "A novel library screen identifies immunosuppressors that promote osteoblast differentiation." in: Bone, Vol. 50, Issue 6, pp. 1294-303, 2012 (PubMed). Sandberg, Eliasson, Andersson, Agholme, Aspenberg: "Etanercept does not impair healing in rat models of tendon or metaphyseal bone injury." in: Acta orthopaedica, Vol. 83, Issue 3, pp. 305-10, 2012 (PubMed). Song, Yang, Park, Song, Han, Youn, Cho: "The role of histone chaperones in osteoblastic differentiation of C2C12 myoblasts." in: Biochemical and biophysical research communications, Vol. 423, Issue 4, pp. 726-32, 2012 (PubMed). Li, Khavandgar, Lin, Murshed: "Lithium chloride attenuates BMP-2 signaling and inhibits osteogenic differentiation through a novel WNT/GSK3- independent mechanism." in: Bone, Vol. 48, Issue 2, pp. 321-31, 2011 (PubMed). Shimono, Tung, Macolino, Chi, Didizian, Mundy, Chandraratna, Mishina, Enomoto-Iwamoto, Pacifici, Iwamoto: "Potent inhibition of heterotopic ossification by nuclear retinoic acid receptor-? agonists." in: Nature medicine, Vol. 17, Issue 4, pp. 454-60, 2011 (PubMed). Jeon, Powell, Solorio, Krebs, Alsberg: "Affinity-based growth factor delivery using biodegradable, photocrosslinked heparin-alginate hydrogels." in: Journal of controlled release : official journal of the Controlled Release Society, Vol. 154, Issue 3, pp. 258-66, 2011 (PubMed). Bragdon, Thinakaran, Moseychuk, Gurski, Bonor, Price, Wang, Beamer, Nohe: "Casein kinase 2 regulates in vivo bone formation through its interaction with bone morphogenetic protein receptor type Ia." in: Bone, Vol. 49, Issue 5, pp. 944-54, 2011 (PubMed). Background publications Heng, Paule, Hardman, Li, Singh, Rainczuk, Stephens, Nie: "Posttranslational activation of bone morphogenetic protein 2 is mediated by proprotein convertase 6 during decidualization for pregnancy establishment." in: Endocrinology, Vol. 151, Issue 8, pp. 3909-17, 2010 (PubMed). Celeste, Iannazzi, Taylor, Hewick, Rosen, Wang, Wozney: "Identification of transforming growth factor beta family members present in bone-inductive protein purified from bovine bone." in: Proceedings of the National Academy of Sciences of the United States of America, Vol. 87, Issue 24, pp. 9843-7, 1991 (PubMed). Sampath, Coughlin, Whetstone, Banach, Corbett, Ridge, Ozkaynak, Oppermann, Rueger: "Bovine osteogenic protein is composed of dimers of OP-1 and BMP-2A, two members of the transforming growth factor-beta superfamily." in: The Journal of biological chemistry, Vol. 265, Issue 22, pp. 13198-205, 1990 (PubMed).